Other websites' cookies can also be placed on your device when you click on links, or share content on social media. Welcome to my blog! 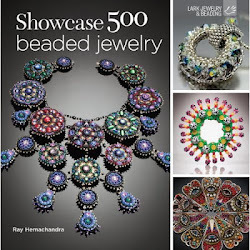 I love beading and this blog is an attempt to share a few of my beady tries and things, thoughts and thrills and inform you about what's new (patterns, jewelry, etc..) I got hooked by the wonderful art of beading in 2004 and never stopped since then. I live in Switzerland, in a small town between Geneva and Lausanne. 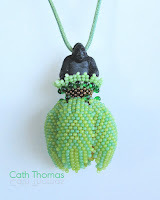 It is my hope that this comes to mind when looking at my latest necklace, The Leaf. 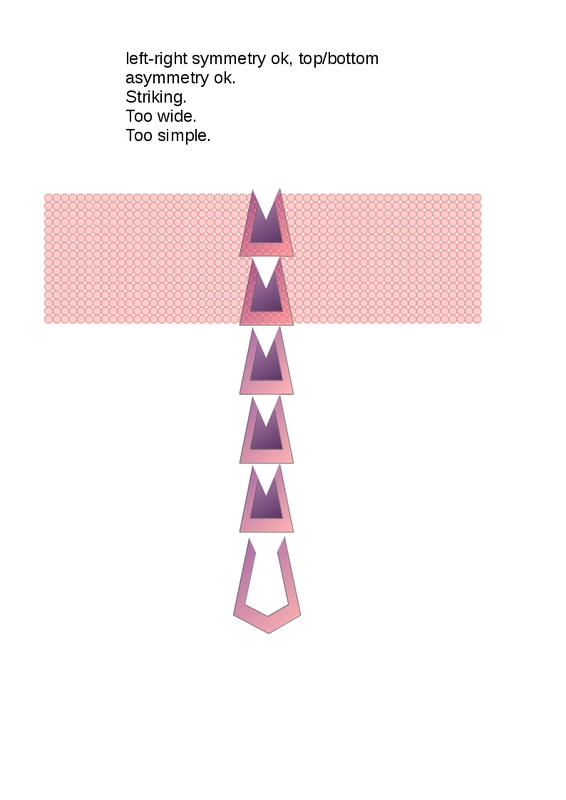 Because some designs look really simple once they're finished, many think that it was easy. But the road leading to it was not necessarily simple or easy. 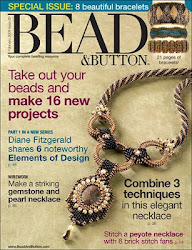 This article is about the design process for this necklace. 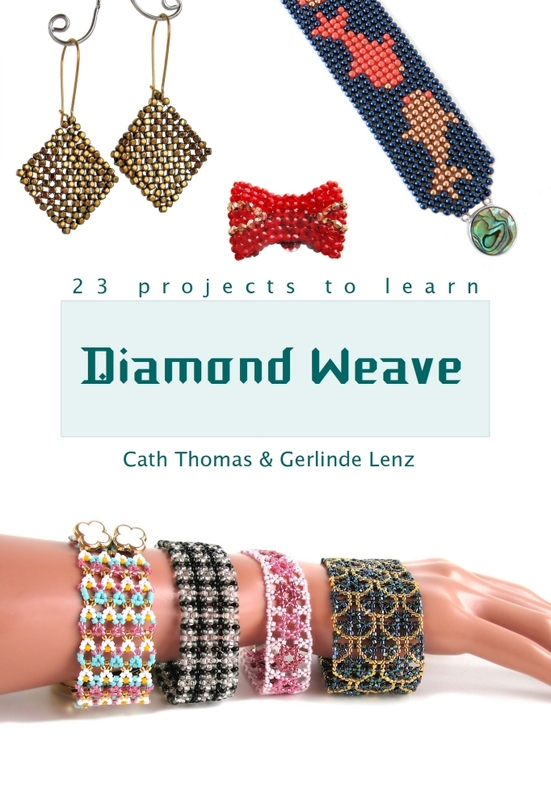 I took plenty of photos and made notes to write this post to show it to you. 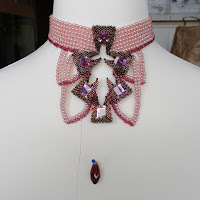 You will see that this design was not just made with Dimensional Peyote and Diamond Weave, but also with a looooot of frog stitch. 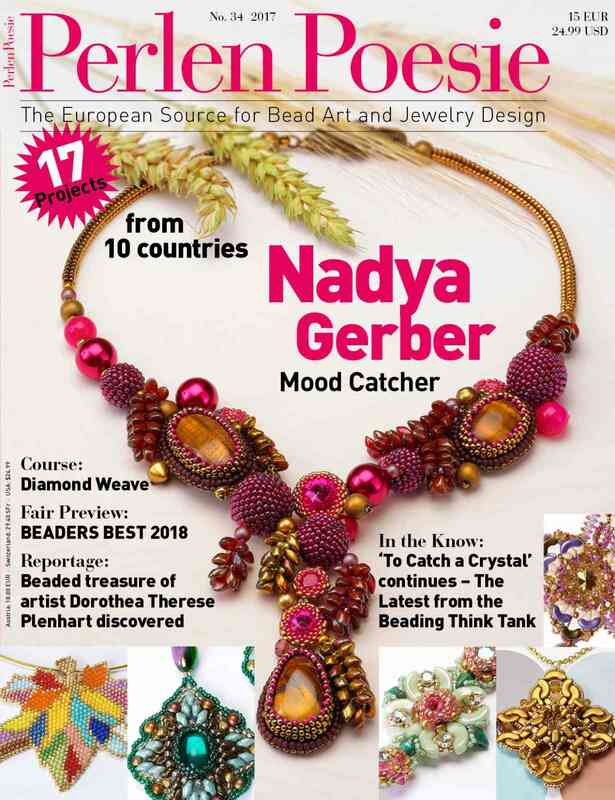 I made this design for the annual International Bead Award (IBA), a beading contest organized by Perlen Poesie, a beautiful Magazine printed in Germany. 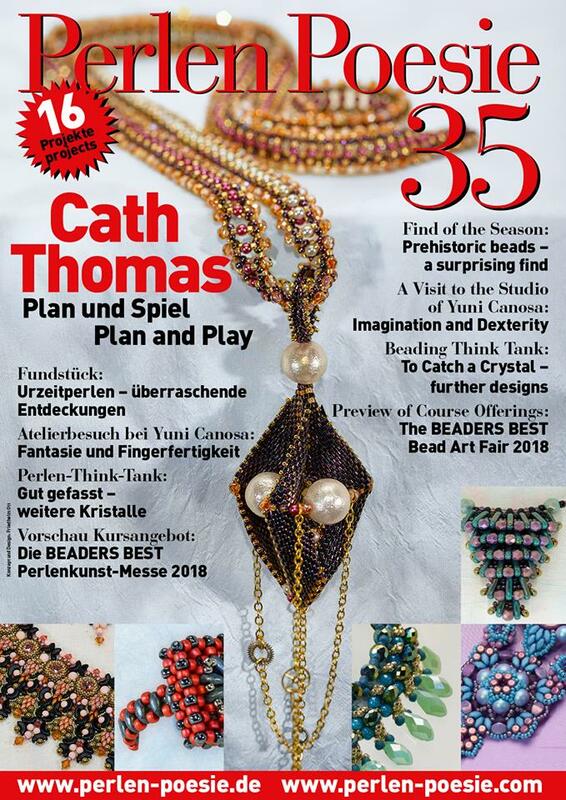 In can only recommend it: it is very beautiful with many interesting projects and articles, and in this month's issue, the wonderful, incredibly talented Claudia Cattaneo is in the spot light. The IBA contest is theme-based, this year Art Deco - Clean Lines / Simple Sophistication. 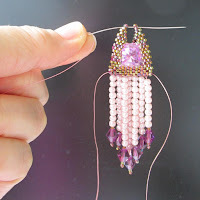 I immediately started dreaming of beading something with Trapezino shapes, because I had made a deco-ish pendant with it already, which I really love. 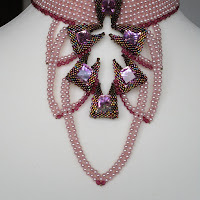 So I beaded and beaded Trapezinos and when I had a good pile of them I started playing with them. 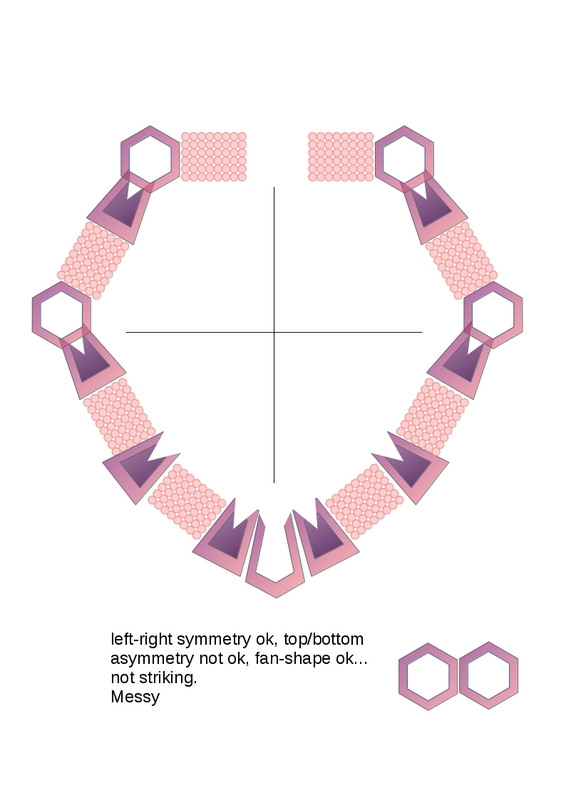 I also bought special hexagonal findings, which I included and assembled but nothing worked the way I wanted. It became quite a quest. 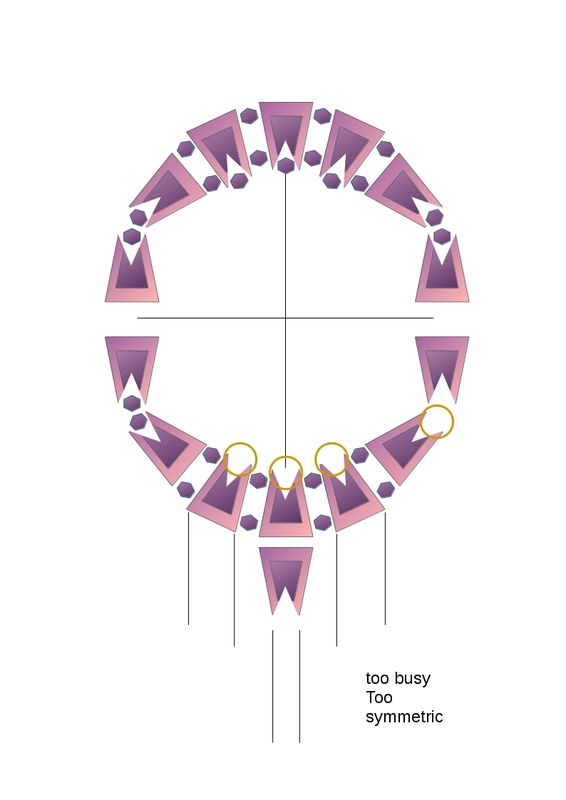 A lot of frogstitching later, I decided to draw various necklaces with a software because beading this much was asking my arms too much. See the sketches with some annotations below. and ask hubby if he likes it. Drawing with software does not necessarily translate into success, but it helps rejecting options. I put it all aside during a couple of months. After that, I came back to the Trapezinos with a fresh spirit, which resulted in something completely different and surprisingly beautiful: put in a certain sequence, a leaf became suddenly visible in the negative space between the shapes. I fell in love. Finally! 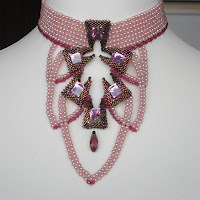 It is necessary to fall in love with a design for a contest, at least for me: if it is not selected in the finals, I'm still happy with what I made, and the time invested is not regretted. Already with nothing added, it was beautiful. 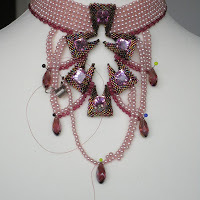 With beautiful focals or pendants I find it more challenging to add material. I really wanted the leaf to stand out, but of course needed to add some 'sophistication' to the 'simple'. 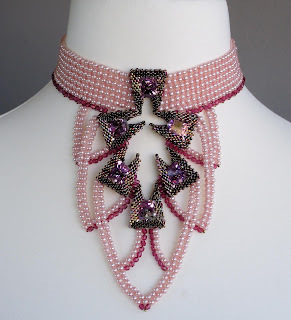 First I added the pearl collar, using Diamond Weave. I think that DW creates a very beautiful, sleek look. 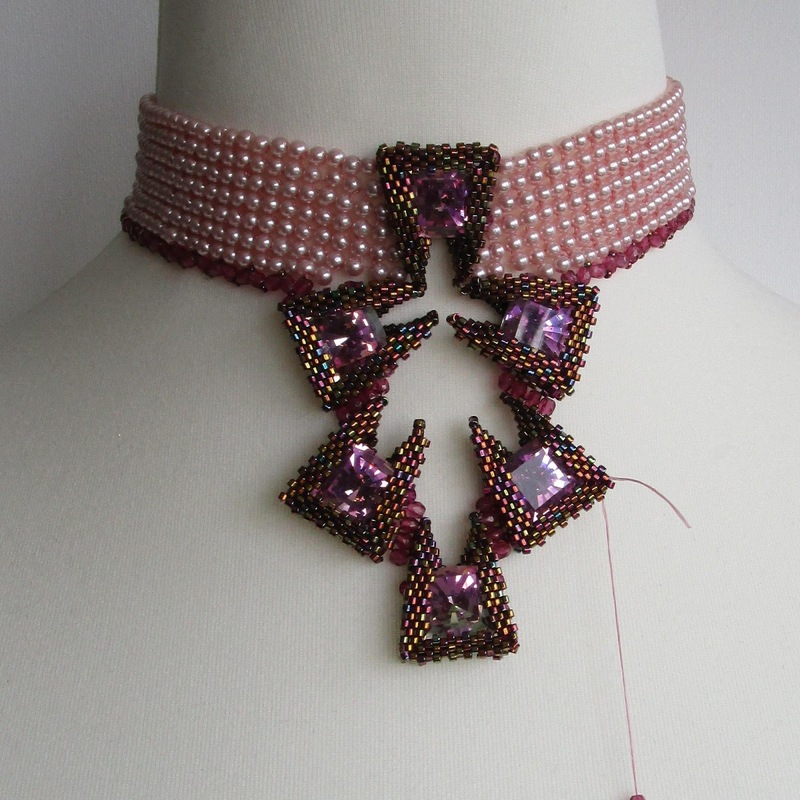 I redid the band later to make button holes for the 'two-button' clasp. 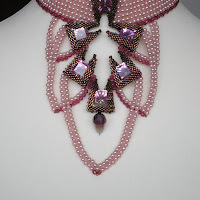 Then I added an extra row of Fire-polished beads for more color. 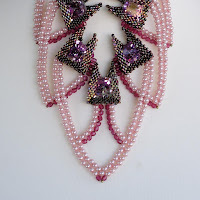 I decided to frame the leaf with a stylish, open lotus petal structure and to add fringe to the clasp. 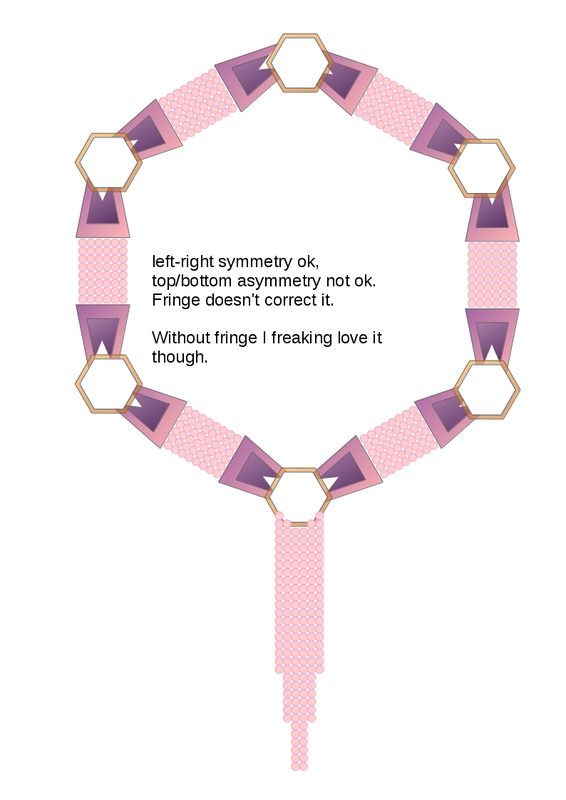 This part got frogstitched several times too, even one time because I made it intentionally "wrong": see the photo left: there is a a different left and right part, to see what would look best. 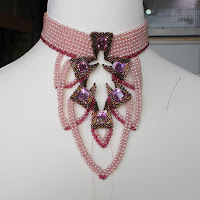 To see how a necklace drapes and how teardrops would look, and have a better sense of size, I like to work on a bust of my neck-size and use pins. For a harmonious curve, the bottom 'leaf' became pretty long, and so I had to find something to fill that big empty space... I tried to add a variety of drops/briolettes but found them to take away interest from the leaf. is a source of great joy. The front was nearly finished, but I really couldn't think of an acceptable finishing touch. That are moments where I can be pretty rude with Eddy, my muse. Forntunately, he (inspiration) came back quite fast under the form of a repetition of the arcs above! And so voilà: the front was done. the negative space was added. 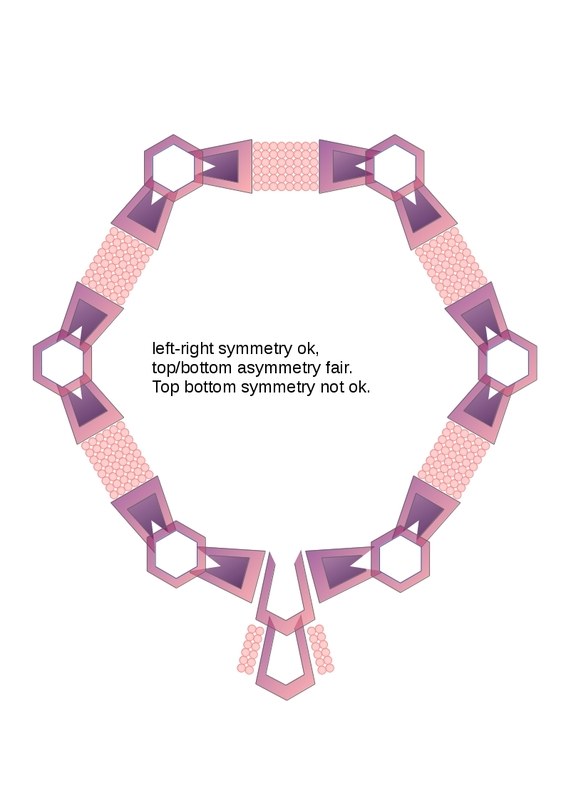 Then the clasp: a fringe hanging from a diamond was ok from an 'interspace' point of view, but the central diamond didn't offer many places to attach the strands. 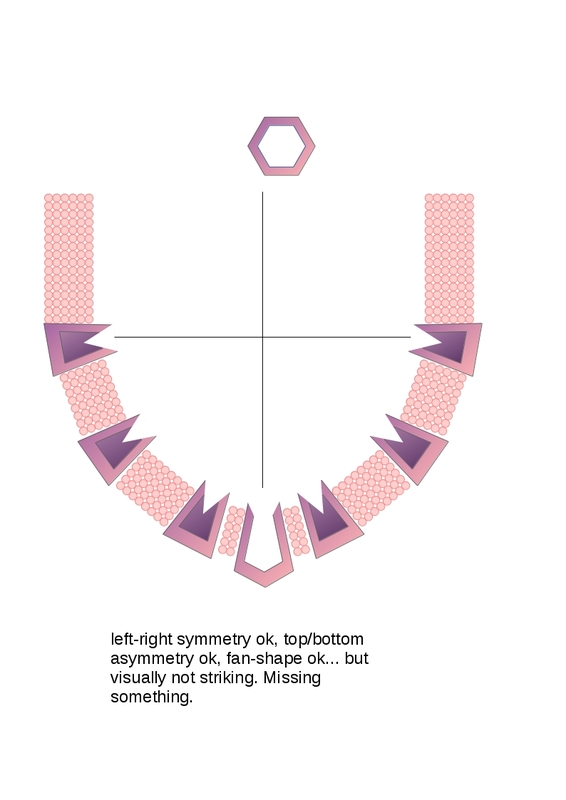 I created an "obtuse isoceles", a triangle wider then high, also with a leaf design (trefoil) in the negative space. 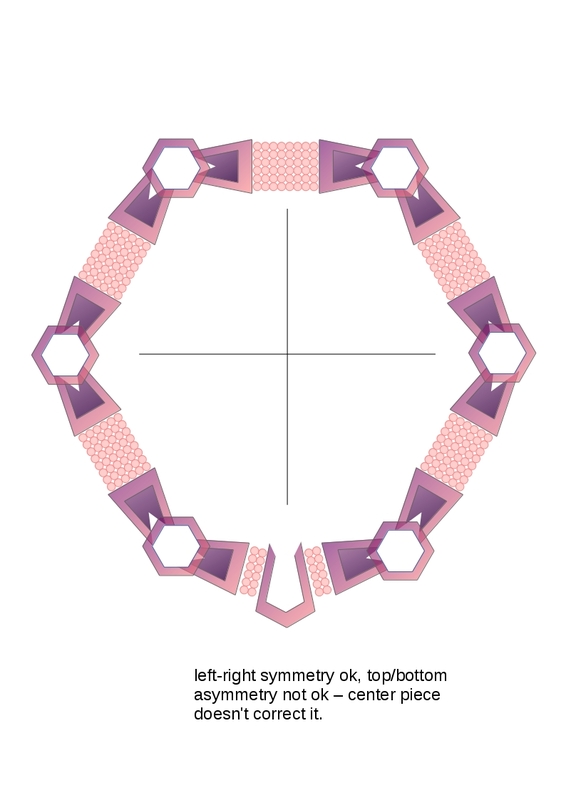 Each 'button' is attached to the two top points of the triangle. I am very happy with this design. 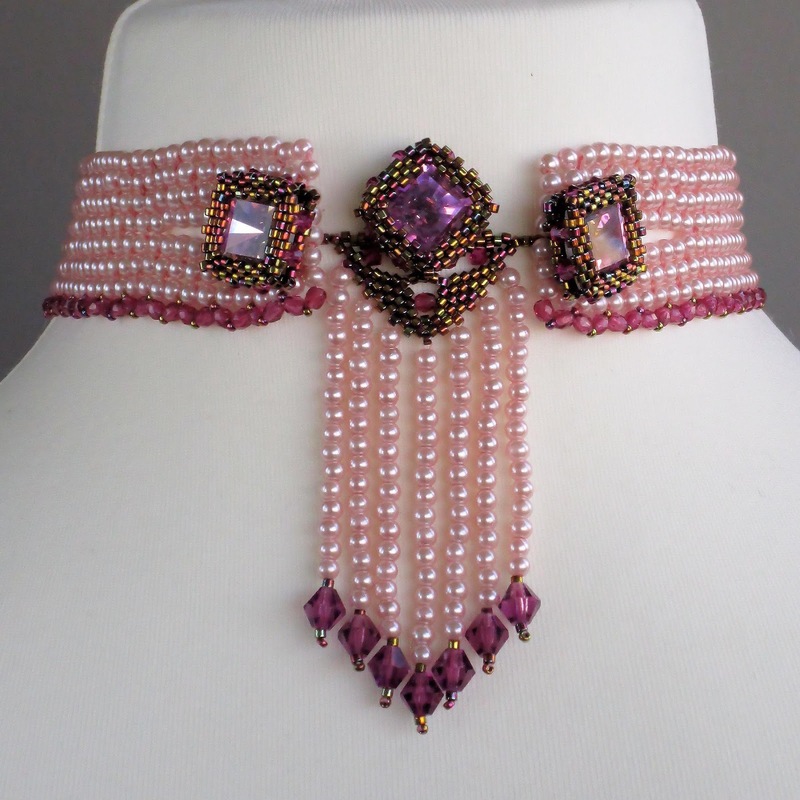 It is part of the nominees in the contest in company of very beautiful beadwork made by amazingly talented beaders: https://www.perlen-poesie.com/news/iba-2016-nominees. One day, very early in the morning, I was up before all the others at home and sat on the ground, on the carpet where I used to play with my brothers, somewhere between the dining table and the living room. 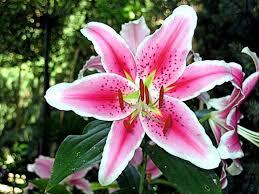 I was about 5 or 6 years old and sat there, looking at beautiful pink lilies in a vase near the carpet, one big flower bud right in front of my face. And suddenly, right before my eyes wide open of surprise, the flower opened up. Slowly, but steadily. It opened as if it had been waiting for me to say hello. I will never forget it. It was so beautiful that it was life changing. That day the nature and animal lover in me awakened. 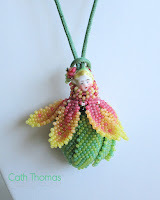 It is probably also part of the reason why I founded the Facebook Group "From Petal to Pod". Before I became light intollerant (lamps of all sorts, sun, electrosmog, etc.) I worked for the International Union for Conservation of Nature. I was happy to do something for my planet, for Mother Nature. Locked up at home, watching days go by, I felt totally useless. 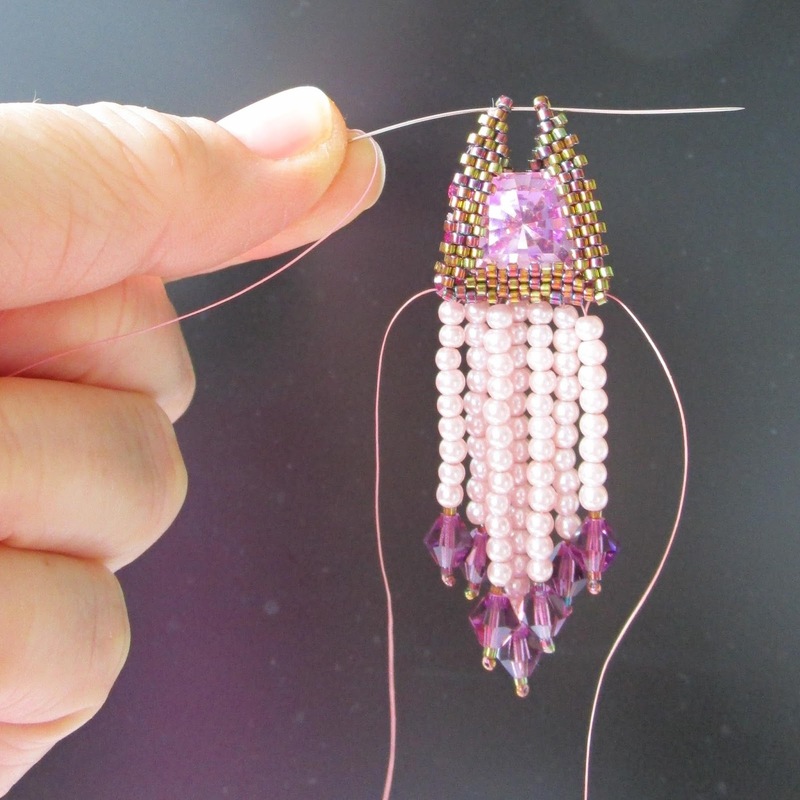 Fortunately, beading prevented me from going nuts, but still... I didn't want to be useless. The question "what can I do to fulfill my soul's unique purpose" remained. Jane's quote woke me up. It is not necessary to be a super hero. I may be locked up because of my light intollerance, but still can do some things in addition to recycling everything that can be recycled. We all love Mother Nature, but often we don't know what to do to help her. The answer is: help those who help Mother Nature. 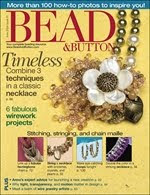 I thought: I can bead, bead as only I can bead and sell what I make to raise funds. 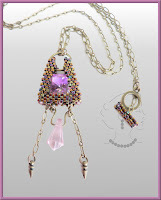 So here is the result: a beaded sculpture / pendant / toy to raise funds. 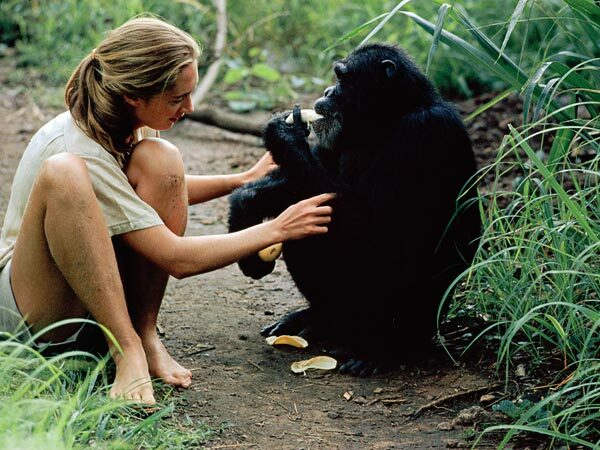 The proceeds will go to the Jane Goodall Institute. 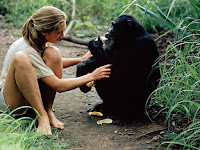 http://www.janegoodall.org/. 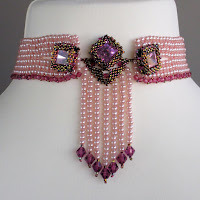 It is listed in my Etsy shop and entered in the Etsy Beadweavers' Team Challenge of September, which theme is "Our Wonderful World". Because our world, our planet, IS wonderful and worth every effort, small and big. 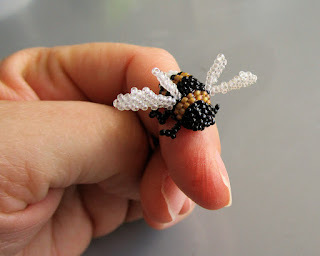 I also designed a little bumblebee to raise funds for Planet Bee. Because bees are dying worldwide at an worrying pace, and even though most countries have their food and drug security agencies who worry about bees, it is important that other organizations and foundations spread their knowledge and focus on subjects which are often not taken into consideration by governmental agencies. 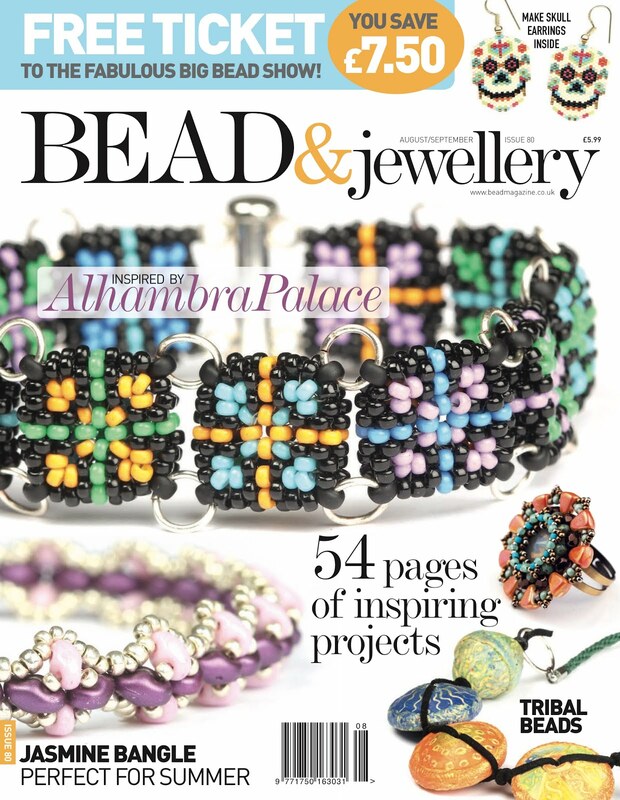 Planet Bead helping Planet Bee. Doesn't it sound wonderful? I am Dutch and live in Switzerland since 1980. 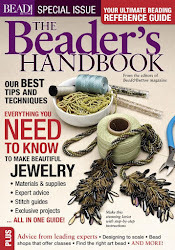 I am happily married and my favorite activity is off-loom beadweaving, bead embroidery and other techniques, to make jewelry and sometimes objects. 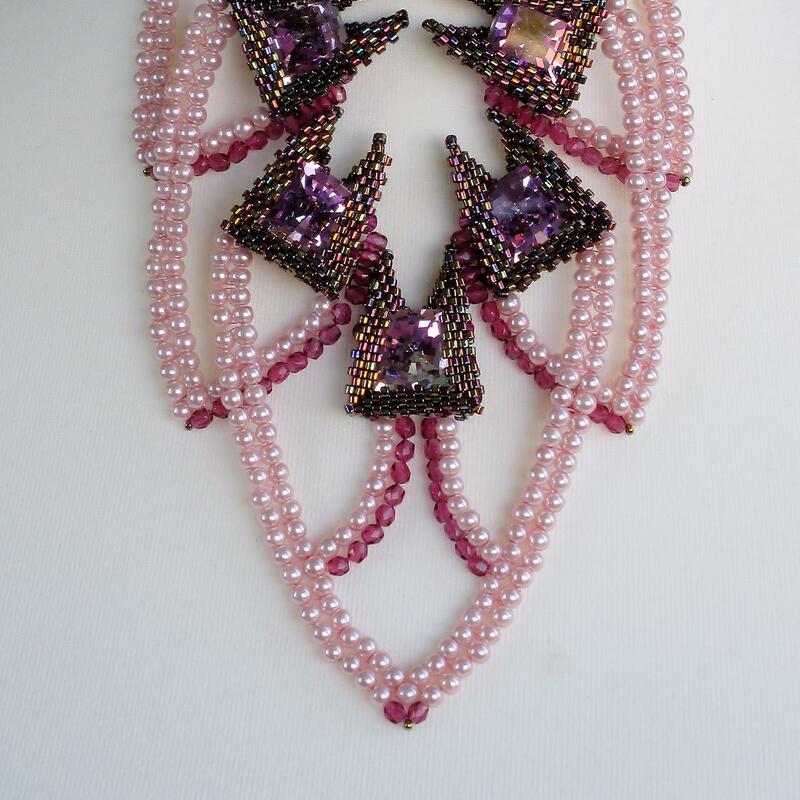 Beading is a wonderful art. 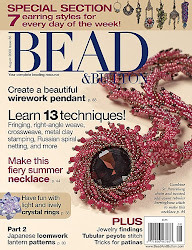 Thank you for being part of my beady world. 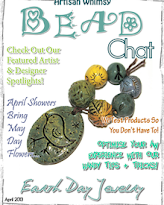 Click here to receive my newsletter to be informed about new tutorials and specials. Your data won't be shared with anyone. 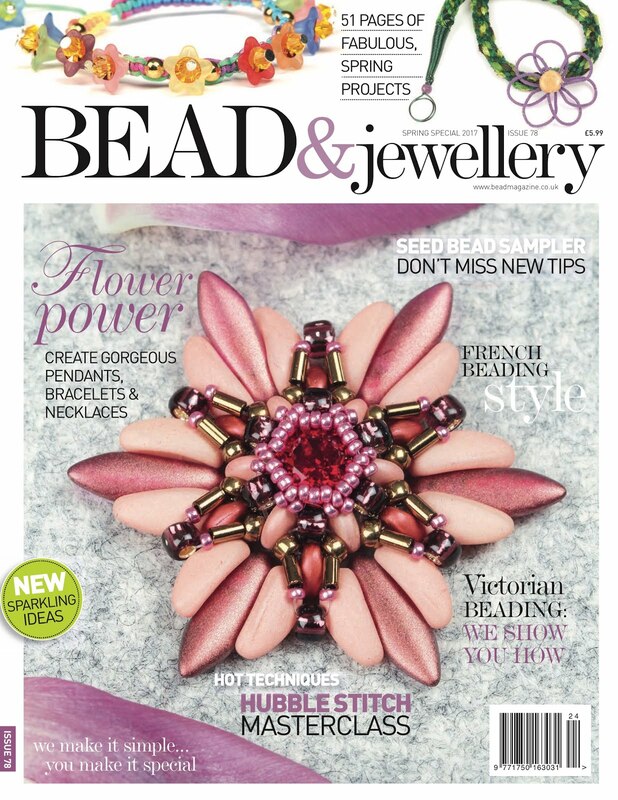 to see all my patterns and the stories behind special piece or to download freebies. 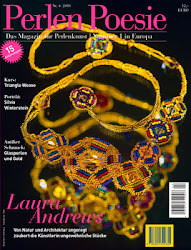 A great interview as featured artist, and the project "New Year's Eve"
A wonderful interview and a DW basics project. 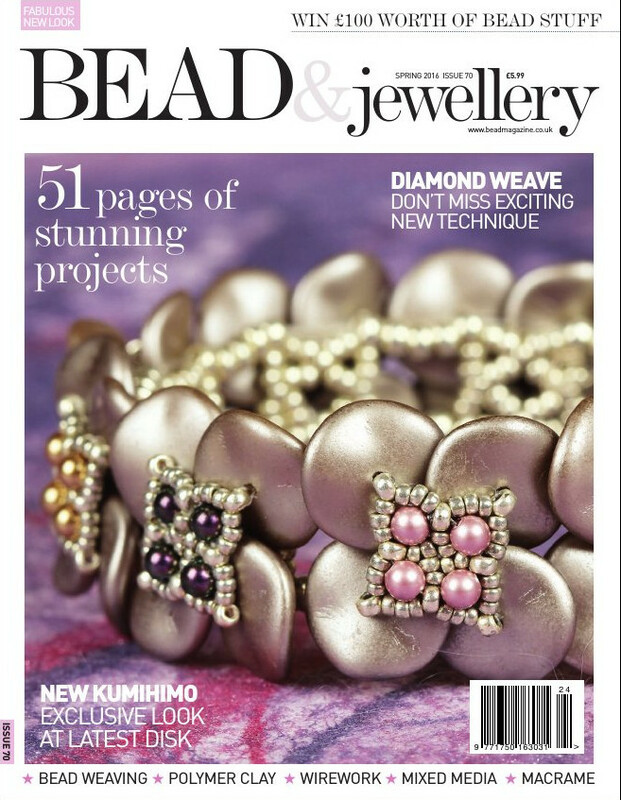 I have contributed to this book as part of the editorial team and as a beader. 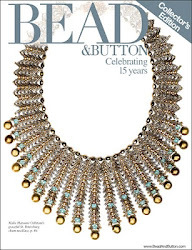 Best of one year Bead & Button Magazine feat. 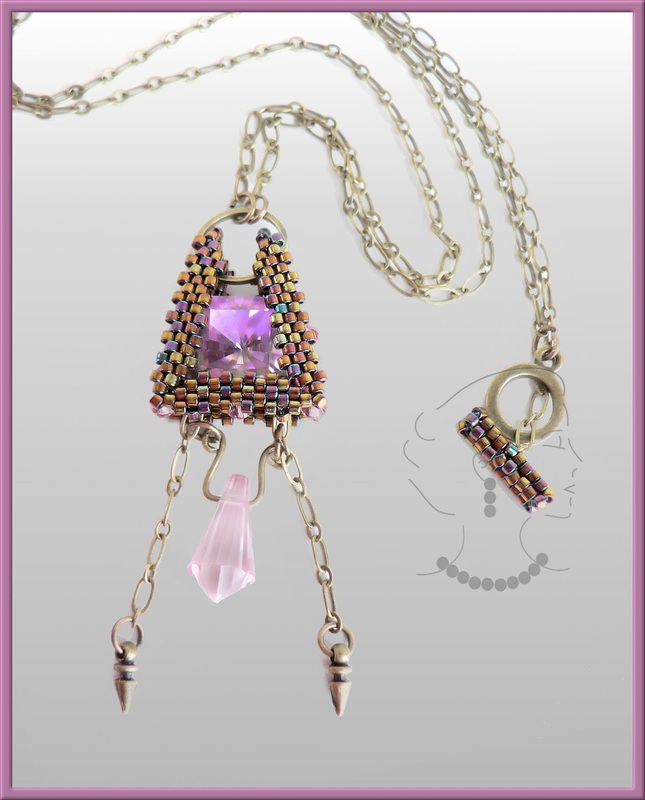 Project "Marquise de lis" ("Rockeuse de Diamants"). 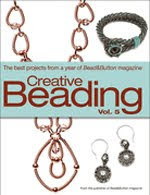 "Easy ends for memory wire"
"How to make a curvy St.Petersburg chain"
All images and texts © 2012-2019 Cath Thomas.
. Awesome Inc. theme. Theme images by Jason Morrow. Powered by Blogger.